Click Here to see the list of Banknotes Available. PRICING - Bulk buying wholesale prices are available upon request. All listed notes are priced in US Dollar. GRADING - All notes are guaranteed genuine, original and described as per strict IBNS grading standards. If not satisfied, the banknotes can be returned within 7 days of receipt for refund or exchange. ORDERING - To avail the free Shipping and Handling facility the minimum order of $ 100.00 is required. WHOLESALE - Please contact us for inquiries on wholesale purchases. PAYMENT - All payments must be made in advance in US dollar by money order, personal check or draft drawn on a US bank. For secure transaction and early shipment, payment through PayPal is preferred. SHIPMENT - All items will be shipped upon receipt of payment directly from Nepal via Air-Mail Registered Post. Expected time of delivery all over the world is 7 to 10 days. You can also use our online form to submit your inquiries/questions Here! On 12th April, 2007 Nepal issued Rupees 10 x 16 Different Himalayan Orchid flower stamps per sheet (Miniature Sheet). Picture shows the First Day Cover, issued on this occasion. On 14th March 2007, Nepal Philatelic Society (NPS)has issued only 500 pieces “Commemorative Numismatic and Philatelic Combination Card” with new Rupees 25.00 coin and Rupees 5 stamp to commemorate the new coin issued on the occasion of 125 year of Nepal postage stamp. The postage stamps of Rupees 5,20 and 100 along with Souvenir Sheet of Rupees 125 were issued on 9th October, 2006. On 14th March 2007, Nepal issued a new commemorative coin of Rupees 25 denomination to commemorate 125 year of Postage stamp in Nepal. 7) Quantity: One Million only. On obverse at the left side of the temple top the legend "Nepal Sarkar ko" is printed instead of "Sri 5 ko Sarkar ko", rest of the texts and the specifications are as before with signature # 16. Purchase this from the New Banknotes List section. 1) On April 14th, 2006 one locally printed postal card of Rupee one was issued with the image of 1 anna first issue postage stamp of Nepal. Only 8,963 pieces of this post card were printed and sold out on same day. Hence, it will be a scarce item soon. A must have item for the Nepal postal stationary collectors. 2) On October 9th, 2006 a set of three postage stamp of Rupees 100, 20 and 5 were issued to commemorate this occasion. The images of 1 anna, 2 anna and 4 anna first issued postage stamp and the classic cancellation are depicted on these three stamps. First Day Cancellations were done on this occasion. 3) One Souvenir Sheet of Rupees 125 denomination with 1 anna, 2 anna and 4 anna first postage stamps were also issued on this occasion. The images of all three items are shown here. 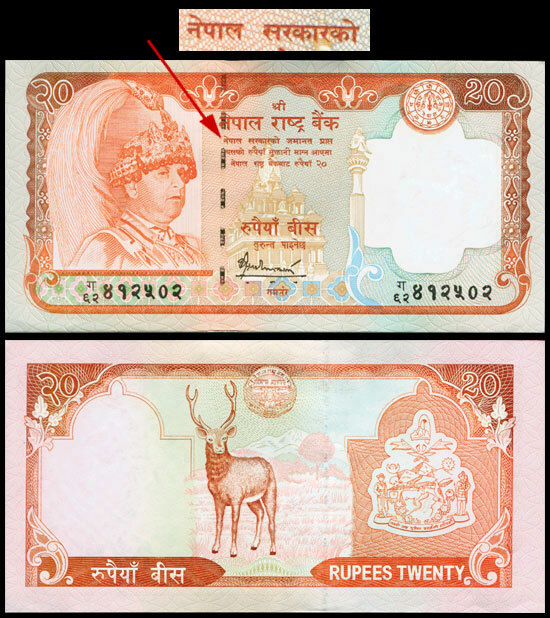 On September 22nd, 2006 Nepal issued a new Rupees five denomination banknote with the vernacular text slightly revised as below; On obverse at the left side of the temple top the legend "Nepal Sarkar ko" is printed instead of "Sri 5 ko Sarkar ko", rest of the texts and the specifications are as before with signature # 16. Limited quantity of commemorative folders issued with Rupees 50 denomination banknote on it, to commemorate the Golden Jubilee Anniversary of Nepal Rastra Bank. It has Mount Machhapuchre at front and Mount Ama Dablam and a pair of Danphe the National Bird of Nepal at back. A must have item for Mountain and BIRD theme collectors. a) Commemorative banknote issued for the Golden Jubilee of Nepal Rastra Bank. c) Color: Green, Red, Yellow and m/c. d) Obverse: Portrait of HM King Gyanendra Bir Bikram Shah Dev in National dress, NRB Golden Jubilee Logo, Mount Machhapuchre, NRB Head Office Building and Ashoka pillar, Lumbini. Reveres: “ Nepal Rastra Bank Golden Jubilee Year 2005” printed above Mount Ama Dablam and a pair of Danphe Bird the National Bird of Nepal. Size: 70 x 142 mm. e) Watermark of King’s portrait. f) Printer: Giesecke and Devrient GMBH, Germany. g) With signature # 16 B.N. Bhattari. You can purchase this from the New Banknotes List section.